Compare and contrast the swift treatment of Fox News host Jeanine Pirro and U.S. Rep. Ilhan Omar (D-Minn.). 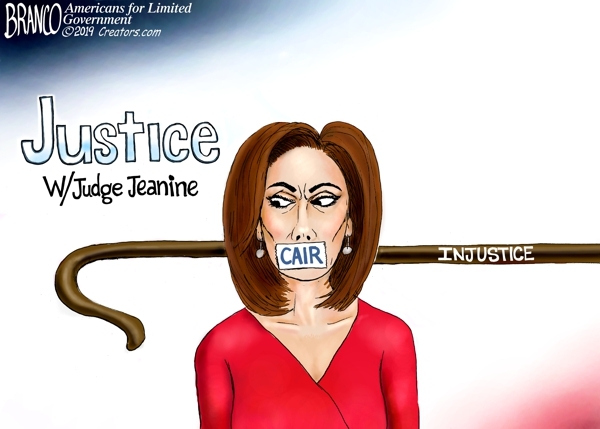 Last week, Pirro questioned if Congresswoman Ilhan Omar’s hijab signifies that she supports Islamic Sharia law and asserted that Sharia law is inconsistent with the U.S. Constitution. Denunciations were swift; and Pirro, the daughter of Lebanese Christian immigrants, was taken off the air by Fox News. For those unfamiliar with Omar’s problematic statements, she once tweeted that “Israel has hypnotized the world, may Allah awaken the people and help them see the evil doings of Israel.” Making matters worse, she defended that tweet earlier this year. In response to a tweet criticizing House Minority Leader Kevin McCarthy for threatening punishment for the anti-Israel comments of Omar and another Democrat, Omar tweeted, “It’s all about the Benjamins baby.” When people sought an explanation of her tweet, she replied, “AIPAC!” which is the American Israel Public Affairs Committee. Also last week, Rabbi Aryeh Spero, of the National Conference of Jewish Affairs, led a group of Israel supporters to Speaker Nancy Pelosi’s office to protest the Democrat House majority’s mild response to Omar’s anti-Semitic comments. The protesters wanted action taken against Omar and were unhappy with the watered-down resolution the House eventually passed condemning various forms of hate. Of course, Pelosi was too busy to speak with them. In his remarks, Rabbi Spero asserted that Pelosi and Democrats are willing to condemn anti-Semitism from the right, but not the left. This has caused him to conclude that they are not actually opposed to anti-Semitism; it is just a means to attack political opponents. Spero also noted that Omar had accused Israel supporters of dual loyalty but the protesters had not questioned her loyalty to the United States in spite of the fact that he is certain she supports Islamic states. Rabia Kazan, of the Middle Eastern Women’s Coalition, read a letter from the father of Daniel Pearl, the Jewish journalist who was murdered by terrorists in Pakistan. Although Judea Pearl is a lifelong Democrat, he urged Pelosi to find Omar unfit to serve on the House Foreign Affairs Committee. Nearly a week has gone by, and Pirro is still suspended from Fox News while Omar still serves on the Foreign Affairs Committee. Why is it acceptable for an ultraliberal like Omar to insinuate that Israel supporters have divided loyalties, but unacceptable for a conservative like Pirro to question Omar’s loyalty to the Constitution? Why did Fox suspend Pirro – instead of following the House Democrats’ example and issuing a vague statement opposing hate or religious bigotry? Or better yet, why not give Pirro an opportunity to hold a panel on her show on the issue? Why is a television show host being held to a higher standard than a Member of Congress?